This interview originally appeared in Popmatters. For Chicago-native beat-maker/producer Ramon Norwood (aka Radius), the city’s neighborhoods are more than just secondary landscape to his music-making. The nine neighborhoods and two interlude roadway tracks are the music, a vividly real sonic canvas he used on his debut album, Neighborhood Suicide, expressing all aspects of the emotional terrain he’s absorbed and traversed during his life thus far at age 26. The album captures a period when he fought to flip the script on a barrage of frustration, confusion, and depression, all unfortunate companions to the doldrums of a brutally cold Chicago winter. 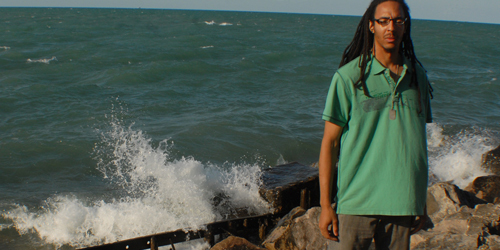 During the winters of 2006-2007, Norwood battled to find the significance of the nine neighborhoods and how they impacted his life and music utilizing soulful samples, hypnotic beats, and deftly placed sound bites, as well as a genuine love for Chicago’s beat-driven traditions and richly diverse cultural real estate. To get the feel of the album’s sonically physical roots, I meet Norwood at Hyde Park’s Promontory Point, a pivotal place for Chicago’s hip-hop and house scenes on the city’s south side. From there, Norwood discloses his deep love for Chicago music history, his frustrations, and how the album was a deep emotional journey he needed to take in order to survive, all while we walk along the same streets he pays tribute to. Behind us is the field house, a hangout spot that Norwood references on the eighth track, “Hyde Park (I Miss You)”, amidst a steady stream of dreamy pianos, gently popping snares, and smooth bass lines. Norwood also anchors the track’s geographical significance with a sample of Chicago rapper Common’s “Nuthin’ to Do”, getting double use out of its lyrical shout to “The Point” and Common’s soulful influence. The journey Norwood created on the album is a contemplative burrowing that puts you in the passenger seat as you cruise through Humboldt Park, Uptown, Logan Square South Shore, Bucktown, Englewood, Hyde Park, Rogers Park with roadway interludes “Lake Shore Drive” and “90/94”. All the while, Norwood guides, following the aesthetic lead of DJ Shadow’s turntablistic lush layering, Jay Dee’s stand alone beat samples, minimalist repetitious and hypnotic rhythms, a truly tested terrain of soulful stomping, and gospel-tinged hand claps juxtaposed against smooth, laid-back orchestrations of funky, trickling jazz pianos, snappy snares, and righteous hi-hats. Like the album’s journal-style liner notes, Norwood takes me though the local homages of each track’s back story. But since we can’t go to all the neighborhoods in one evening, our journey focuses on Hyde Park’s neighborhood as he expounds on how the music of an area rich in progressive beats and rhymes was his melodic medicine. When I ask him which specific albums he’s used on Neighborhood Suicide, he pauses awkwardly, which is completely understandable. 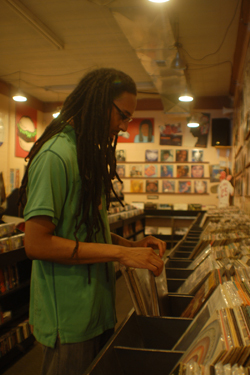 An artist like Norwood prides himself on the art of crate-digging, hoping to find that perfect buried groove that he can sample, re-contextualize, or even better, twist around a more recent beat from a top artist without listeners knowing, but still enjoying his new instrumental interpretation of a perfect jazz or juke beat, gritty blues riff, or brassy soul horn blast sample. With the setting sun and Hyde Park Records behind us, our journey nears its end, heading inward, as Norwood explains the heavy emotional undercurrent and the two-year span it took to make the album. Staying constant with the mathematics inherent in his moniker and music making, Norwood is excited about his next project π (Pi), which is expected to release later this year and is a collection of tracks he’s created incorporating reinterpreted clips from the 1998 movie of the same name.